There are a number of ways to follow the latest happenings in Northeast Conference hoops, including doing so On the Run. The latest “hoops edition” of the NEC On the Run video podcast prepares fans for the full weekend of basketball ahead – six games on Thursday night, 12 on Saturday and another six on Monday night. This week’s podcast features a special conversation with former Mount St. Mary’s star Vanessa Blair. In the segment, the NEC’s Ralph Ventre chats with Blair about her recent selection to the NEC Hall of Fame as well as the great tradition of women’s hoops at Mount St. Mary’s. NEC On the Run will routinely feature a highlight segment entitled #NEC9, during which the show’s host will count down the top nine plays that transpired on the NEC hardwood over the past week. “State of the League” updates will also be included on a weekly basis with Ron Ratner providing the lowdown on the men’s side and Ralph Ventre giving insight into the women’s happenings. The inaugural “hoops edition” of NEC On the Run debuted on Thursday, January 24. Watch it here. The free video podcast debuted in early January when host John Kelly, Jr. and NEC staffer Ralph Ventre sat down to review the entire Fall of 2012. Watch NEC On the Run “Fall Review” here. The best collegiate bowling in America happens in the Northeast Conference. The supporting facts to that argument are plentiful, and Danielle McEwan’s latest accomplishment only strengthens the claim. McEwan is in her fourth year competing for No. 5 Fairleigh Dickinson, one of eight Northeast Conference teams who are ranked in the latest edition of the NTCA Top 20 Poll. No other conference has more than three representatives amongst the nation’s 20-best teams. FDU’s anchor bowler is as decorated as they come. As the 2011-12 NTCA Bowler of the Year, McEwan led a quintet of NEC bowlers in garnering All-America honors last year, but even that accomplishment pales in comparison to her latest score. Topping Vanderbilt assistant coach Josie Earnest along the way, McEwan won the individual championship at the Team USA Trials for the second year in a row. The crown means McEwan can claim to be the best amateur bowler in America for the next 12 months. McEwan is the first bowler in nearly a decade to repeat as the Team USA Trials champion. The reigning NEC Bowler of the Year will be the sole US representative at the QubicaAMF World Cup and will be a member of Team USA during the calendar year. For now, however, it’s back to NCAA competition for McEwan and Sacred Heart senior Jackie Carbonetto, who also contested the Team USA Trials and will be a member of Junior Team USA in 2013. With the second half of the NCAA season underway, all 10 Northeast Conference teams will contest the Kutztown University Invitational on Jan. 25-27. NEC member Kutztown, which is ranked No. 10 in the nation, will host the largest NCAA bowling meet of the season for the fourth consecutive year. If the number of its Top 20 teams isn’t enough to set the NEC in a class of its own, then how about the fact that one of its members hosts the nation’s most-attended NCAA meet? Or the fact that 33 percent of All-America honors handed out last year went to Northeast Conference bowlers? Oh, and no other conference is home to the two-time defending Team USA Trials Champion. Following a six-week hiatus, the 2012-13 bowling season has resumed. Four of the NEC’s 10 members lifted the lid off the season’s second half this past weekend (Jan. 19-20) at the Terrier New Year Knockdown. Hosted by NEC member St. Francis Brooklyn, the eight-team tournament field also included LIU Brooklyn, Kutztown and Sacred Heart. Defending NCAA champion Maryland-Eastern Shore, which hails from the MEAC, also contested the event, which was won by No. 9 Wisconsin-Whitewater. LIU Brooklyn accounted for the best showing of the NEC contingent (in terms of total pinfall). The Blackbirds’ pinfall trailed only that of UWW and UMES. Despite bowling well, LIU ran into some hot teams and managed only a 5-7 win-loss record as a result. “We had a lot of close losses this weekend to top-ranked teams, so with small adjustments in practice this week and spare practice, we hope to make up for this weekend at the Kutztown Invitational next weekend,” said LIU head coach Kayla Jones, who was a first team all-NEC selection during her playing days at Kutztown. Bidwell came off the bench and made some noise during the Terriers’ New Year Knockdown. With LIU Brooklyn, along with three other NEC programs, opening the second half of the 2012-13 season at the eight-team meet, Bidwell saw her first action in the third match of the weekend. The rookie righty’s first traditional team game of 2013 was a 243-pin performance in a runaway win over MEAC member Hampton. Bidwell was at her best during the traditional play portion of the two-day tournament. She accounted for a 206.75 average over four matches, three of which were victories for the Blackbirds. When factoring in her baker performance, Bidwell averaged 19.2 pins per frame over the course of the weekend. She converted 31 of 72 (.431) strike attempts and posted an .817 filled frames percentage. The NEC Rookie of the Week honor is the second of the season for Bidwell. The first-year Blackbird first earned the award on Nov. 14 after posting a 212.9 average at the Northeast Conference Fall Meet. The Northeast Conference hosted its usual championships and doled out the annual awards, but there was hardly anything ho hum about the 2012 fall season. The first three-plus months of the 2012-13 academic year were home to numerous new ground-breaking moments for the Northeast Conference and its 12 Division I members. The league continued to add to its ambitious list of new initiatives, and put a number of projects in motion. There were also numerous on-field victories that will forever be etched into league folklore and a stream of postseason honors, both athletic and academic, followed. Front Row, #NECPride, FCS Playoff Success, College Cup Sweet 16 and #HelloBrooklyn are only some of the terms that flew around the Northeast Conference this fall. Attempting to revolutionize the way its fans follow and interact with their favorite teams, the Northeast Conference launched NEC Front Row in time for the start of the 2012 fall season. The online digital network with multi-platform access features a rich set of content, including live events, on-demand video, highlight packages, coaches shows, features, original programming and access to league’s extensive digital library, all of which is free of charge to users. The network gives fans free inside access to the stories from across the Northeast Conference and its student-athletes on the field, in the classroom, across campus, and in the community. The centerpiece of the digital network is the video streaming of hundreds of live events from across the Conference. The website also contains a number of fan-friendly features, including a live Twitter feed embedded into the game-viewing interface. Content can also be viewed for free on mobile devices and tablets, including the iPad, iPhone and Android. Just recently, Front Row launched a Control Room feature, that allows fans to watch every live game on one viewing screen. The start of a new basketball season brought a new look to Northeast Conference (NEC) arenas. Through a partnership with Daktronics (Nasdaq-DAKT), the NEC provided each member institution with state-of-the-art digital scorer’s tables. Every NEC member received three Daktronics LED tables measuring three feet high by more than nine feet wide. Designed to enhance the fan experience, the displays are capable of producing motion graphics, hi-res headshots, statistical information, interactive promotions and sponsor information. An industry leader, Daktronics courtside scorer’s tables have been used at the NCAA Men’s & Women’s Final Four in recent years. The Conference also unveiled a new #NECPride campaign over the fall, harnessing the power of social media to spread the message. The #NECpride campaign is built around and highlights the following principles: Achievement. Ambition. Perseverance. Community. Passion. Respect. Determination. Unity. Teamwork. “It is about having pride in your team, your school and the will to succeed both on and off the field,” said Associate Commissioner Ron Ratner. The Conference also produced a new #NECPride themed football promo and unveiled #NECPride hashtag-themed signage and merchandise that appeared at league-sponsored championships and events. For the first time in more than a decade, the Northeast Conference hosted a preseason media day to promote its 24 men’s and women’s basketball teams and added a special twist. Combining social media and a state-of-the-art venue, the NEC hosted “Social” Media Day at the brand-new Barclay’s Center on Flatbush Avenue in Brooklyn on October 23. All 24 head coaches sat down with announcers Dave Popkin and Tim Capstraw for an on-camera chat. A bloggers’ roundtable along with periodic social media updates were also part of the program. The festivities aired live on NEC Front Row and a tape-delayed broadcast aired numerous times on Fox College Sports. The Front Row broadcast was an interactive one during which fans were encouraged to tweet comments and questions with the best making it on air. Sacred Heart alumnae Colleen Wall (@ColleenWall) earned the NEC Overtime! 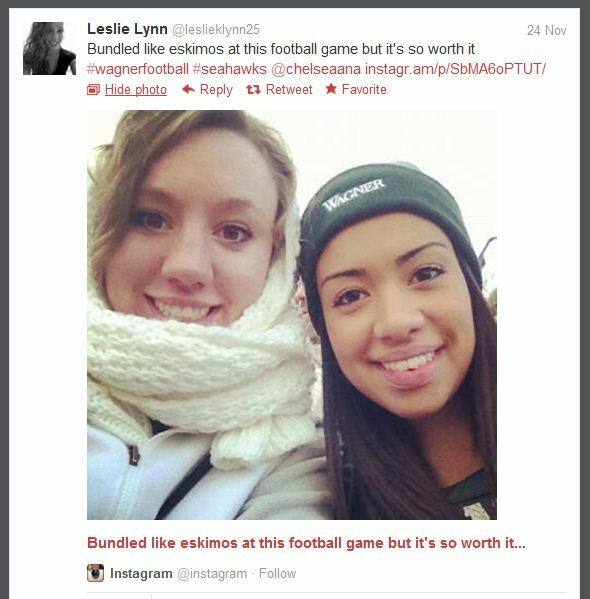 Blog Tweeter of the Day award for her participation. The opening of the Barlcays Center and the return of NEC media day were not the lone notable happenings in Brooklyn this fall. LIU Brooklyn was busy winning games on both the pitch and court. The Blackbirds captured NEC Tournament titles in women’s soccer and volleyball, representing the conference at the NCAA Championships in both sports. Walt Hameline’s Wagner Seahawks picked a fitting way to celebrate the Silver Anniversary of the program’s 1987 NCAA Division III football national championship. Wagner returned to the postseason for the first time since 1988, and managed to posts its first playoff victory since topping Dayton in the 1987 Stagg Bowl. After an 0-3 start to the season, the Seahawks took flight. 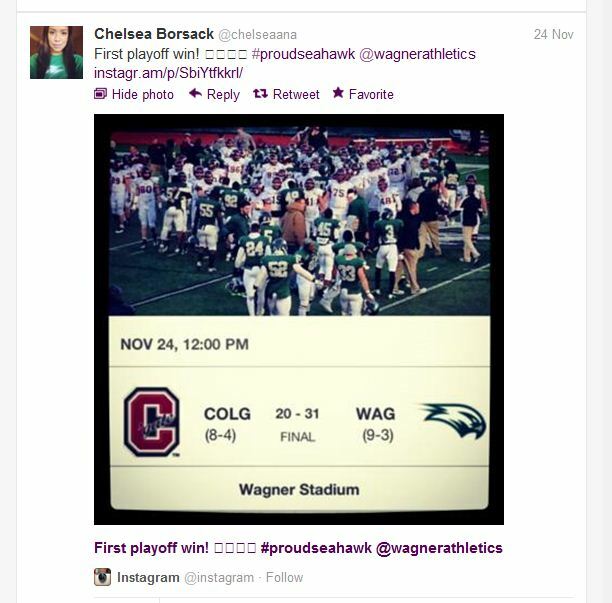 Beginning with a 31-13 triumph at Central Connecticut in the NEC-TV Featured Game of the Week on September 22, Wagner won eight regular season games in a row. A 30-0 shutout of then-No. 20 Albany on November 3 followed by a 23-17 triumph over Duquesne of Nov. 17 clinched the Seahawks’ first-ever Northeast Conference crown and guaranteed them the opportunity to compete for a national championship. Wagner became the third team to represent the NEC in the NCAA FCS playoffs, and the Seahawks did a lot more than just participate. 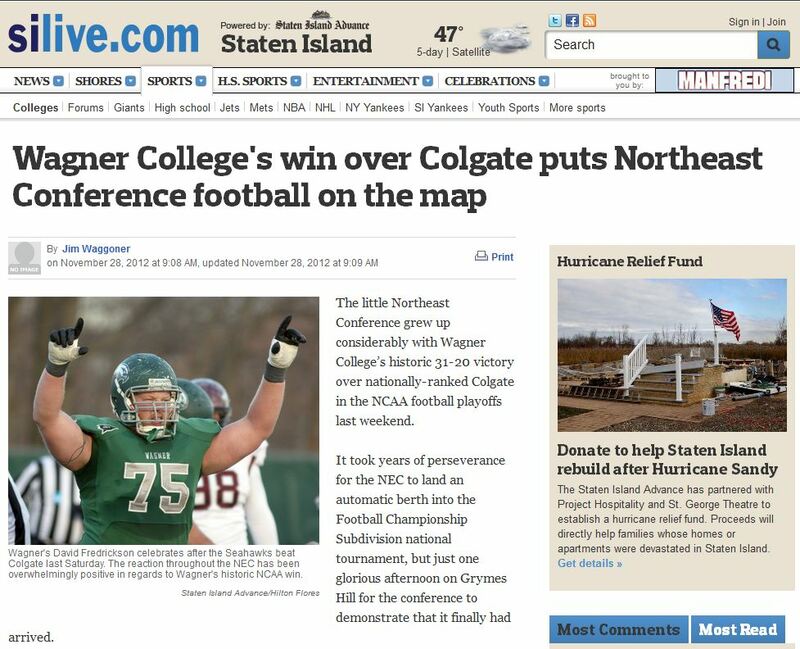 Wagner earned a first round home game, welcoming Patriot League champion Colgate to Grymes Hill and later sending them home to Hamilton with a 31-20 defeat. The wire-to-wire victory, during which the Seahawks’ stellar defense bottled up Patriot League Offensive Player of the Year Gavin McCarney, marked the first FCS playoff triumph for a Northeast Conference member. The Seahawks nearly scored a second postseason victory one week later at Eastern Washington. Taking on the national No. 2 seed in what began as a 20-team playoff bracket, Wagner scored the game’s first points and also held a lead late in the third quarter. Veteran head coach Walt Hameline earned the 2012 NEC Coach of the Year award for leading his Seahawks to the league title after being pegged for a seventh-place finish in the conference’s preseason coaches’ poll. Hameline’s most-trying task came in the days after Hurricane Sandy hit the New York Metro area and left a path of destruction in its wake. The team grew closer during that time, assisting in relief efforts while using football as a needed distraction from the chaos that followed the storm. When all was said and done, the Seahawks found themselves ranked 21st today in The Sports Network Final Top-25 Poll and 22nd in the Final FCS Coaches Poll. It marked the first time an NEC team has ended the season with an appearance in both official Top-25 polls. It has been quite a run for the NEC’s two Garden State men’s soccer programs. Fairleigh Dickinson and Monmouth have won 10 of the last 13 conference championships, and both have enjoyed success on a national scale in the postseason. 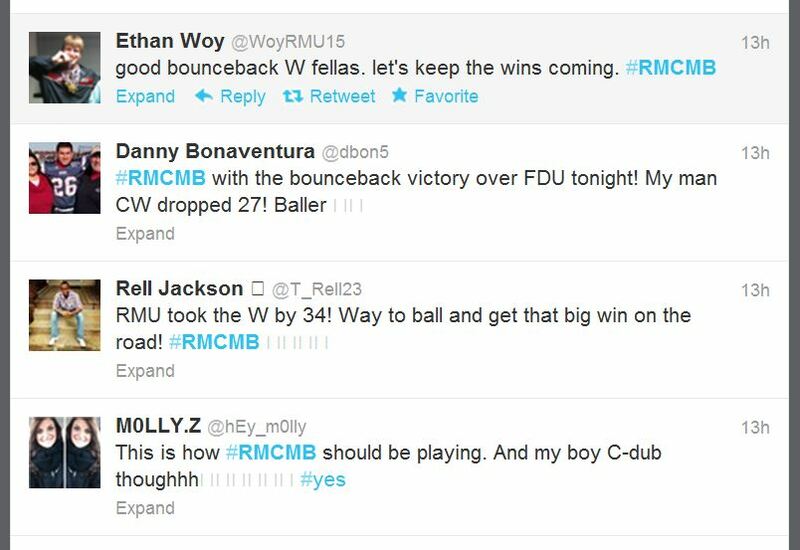 Monmouth entered the 2012 campaign nationally ranked and the coaches’ preseason favorite to win a fourth consecutive NEC Men’s Soccer Tournament title, but at year’s end, it was FDU, pegged second in the predicted order-of-finish, that made an unforgettable postseason run. The journey for the Knights began with a NEC semifinal matchup against Monmouth and ended, in heartbreaking fashion, against the defending NCAA champion in Chapel Hill. After surviving a pair of 1-1 draws in the NEC Tournament and advancing on penalty kicks, Fairleigh Dickinson nearly made its way to the NCAA College Cup Elite 8. The Knights went on the road to defeat No. 18 St. John’s and No.12 Saint Louis in NCAA Tournament play, earning a Sweet 16 matchup with North Carolina. 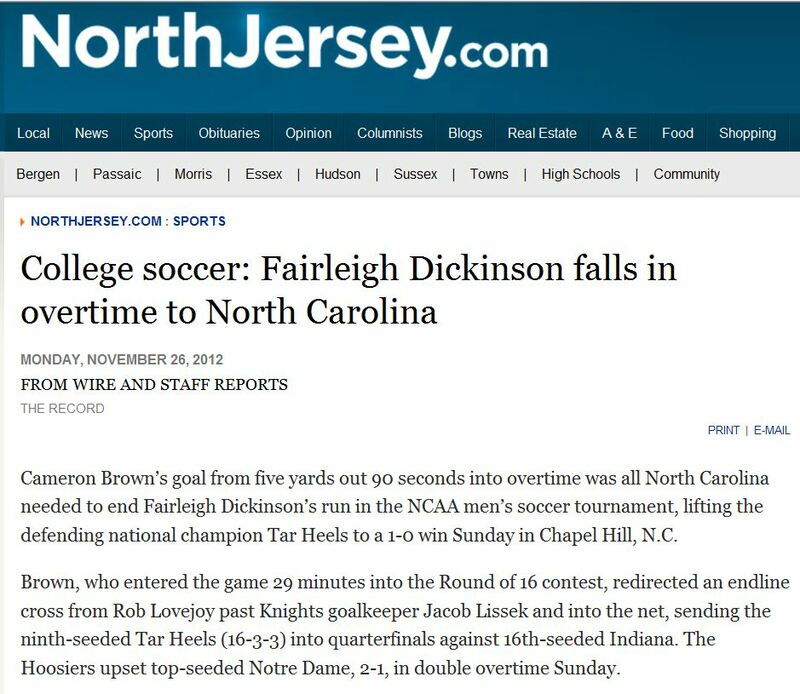 FDU played the defending national champion Tar Heels to a scoreless draw throughout regulation before an overtime marker kept the Knights from pulling off a third consecutive road upset. The remarkable run was nothing Seth Roland’s Knights hadn’t accomplished before, but a full decade had passed since they last made it this far. FDU, which advanced to the NCAA Elite 8 in 2001, has six NCAA Tournament victories under its belt during Roland’s tenure. The final edition of the NSCAA/Continental Tire national rankings slotted FDU at No. 20 amongst the best in NCAA Division I. The Knights, who finished the year 11-6-6, also finished No. 17 in the final College Soccer News poll and No. 16 in the final Top Drawer Soccer rankings. “It’s very satisfying to see the team rewarded with these top-20 rankings in the final national polls,” said Roland. In October, millions across New Jersey, Staten Island and Long Island sat hopelessly in the dark. Superstorm Sandy had just torn through the area, leaving a path of destruction in its wake. The unprecedented storm inflicted unprecedented damage upon the region. With their fellow Americans hurting, a number of Northeast Conference schools and student-athletes extended a helping hand. In numerous cases, the help wasn’t going to complete strangers, but to friends, neighbors and family members. 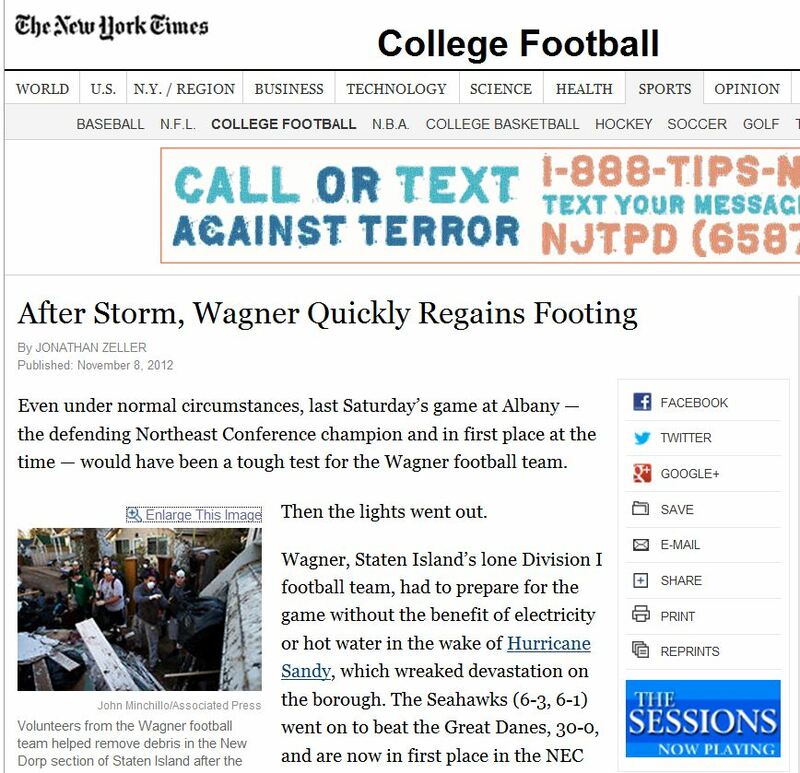 With NEC members Monmouth and Wagner lying in two of the hardest-hit areas, the destruction of Sandy hit extremely close to home. 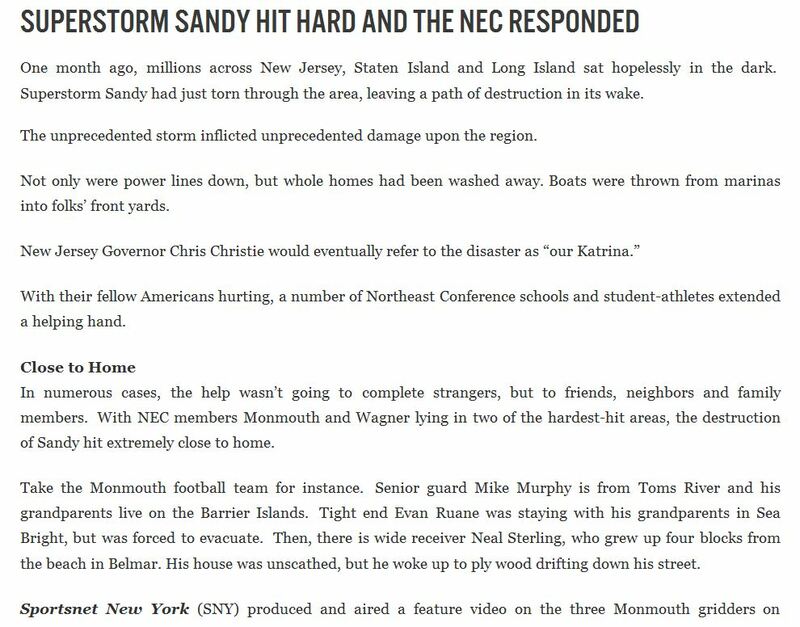 While the students who were directly affected by the superstorm embarked on the long recovery/rebuilding process, others from around the Northeast Conference participated in organized relief efforts, spearheading programs aimed at helping those in need. From sponsoring food and clothing drives, to lending manpower, to providing shelter, to donating funds, NEC institutions, their administrators and student-athletes were there to answer the call. 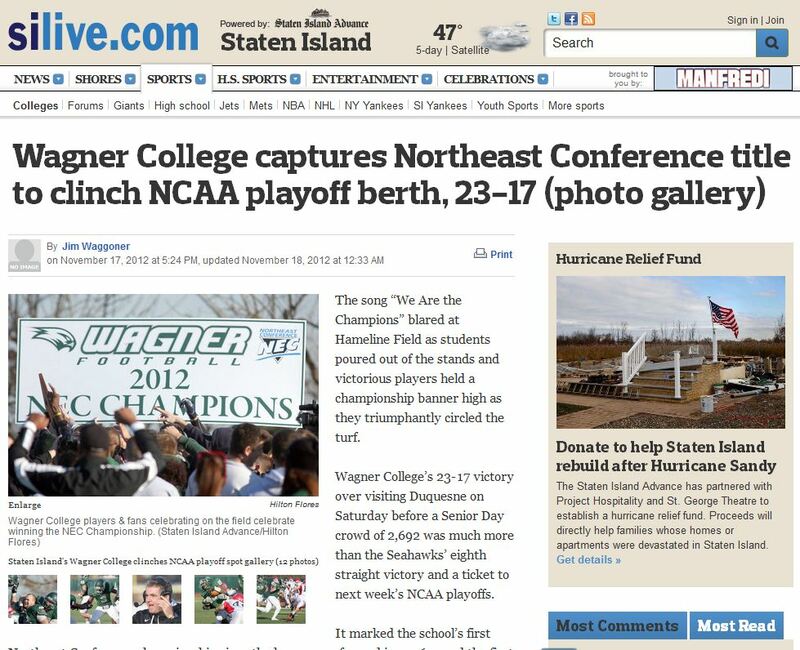 Wagner’s championship run wasn’t the lone piece of history made by Northeast Conference graders this year. A pair of Robert Morris defensive players earned CoSIDA Academic All-America honors, marking only the second time in NEC history that two men from the same team achieved such status during the same season. While linebacker Brad Banas enjoyed his first-ever selection, defensive end Nolan Nearhoof became the first NEC football player to earn Academic All-America status in each of three separate seasons. The accolades didn’t stop there for Nearhoof. After setting the conference’s career record for quarterback sacks in his final collegiate contest, Nearhoof went on to earn the NEC Defensive Player of the Year award to go along with a spot on The Sport Network’s FCS All-America Third Team Defense. Nearhoof was one of three NEC footballers to achieve All-America status. Duquesne linebacker Dorian Bell joined Nearhoof on the third team, while Bryant receiver Jordan Harris made the Sport Network’s second team. Harris had the second-best season (yardage-wise) of any receiver in 17 years of NEC football. Should he produce another season like 2012, Harris will obliterate the NEC’s all-time career receiving yards record. The NSCAA announced its 2012 Men’s University Division Scholar All-America First-Team and it included a pair of Central Connecticut Blue Devils – Thomas Obasi and Reece Wilson. The latter also became the first player in CCSU history to be named to the CoSIDA Capitol One Academic All-American first team. When it came to the women’s edition of the 2012 NSCAA College Scholar All-America Team, Saint Francis University’s Tesa McKibben – the top active goal scorer in NCAA Division I women’s soccer – was named to the second team while two-time Northeast Conference Defensive Player of the Year Alecia McNiff earned a spot on the third team. 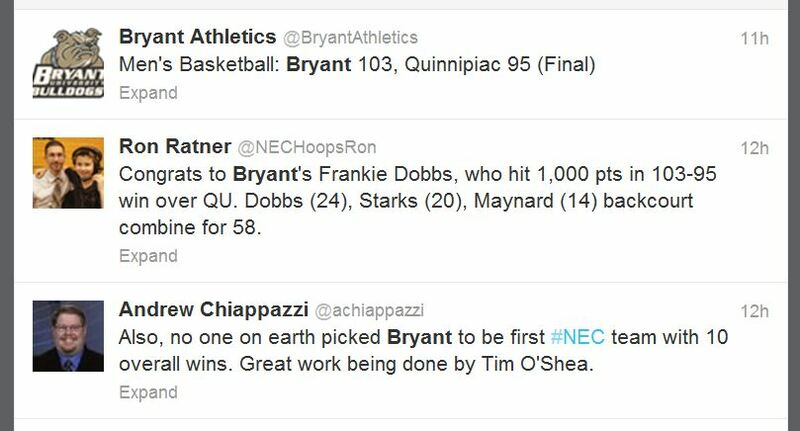 The second Thursday night of the NEC hoops schedule is in the books. Here’s what you missed, if you weren’t watching on Front Row. The reigning NEC Defensive Player of the Year had quite a night on the offensive end for Wagner. Spearheading the Seahawks’ 86-75 victory over two-time defending league champ LIU Brooklyn, Ortiz tallied 19 points and 11 assists. The hard-nosed point guard sank his lone two three-point attempts on Thursday night as Wagner went onto set the NEC single-game record for three-point field goal percentage (.900). Williams used the 3 to help Robert Morris avoid an 0-3 NEC start on Thursdays night at Fairleigh Dickinson. The veteran guard went 8-for-10 shooting from downtown on the way to 27 points in 30 minutes. 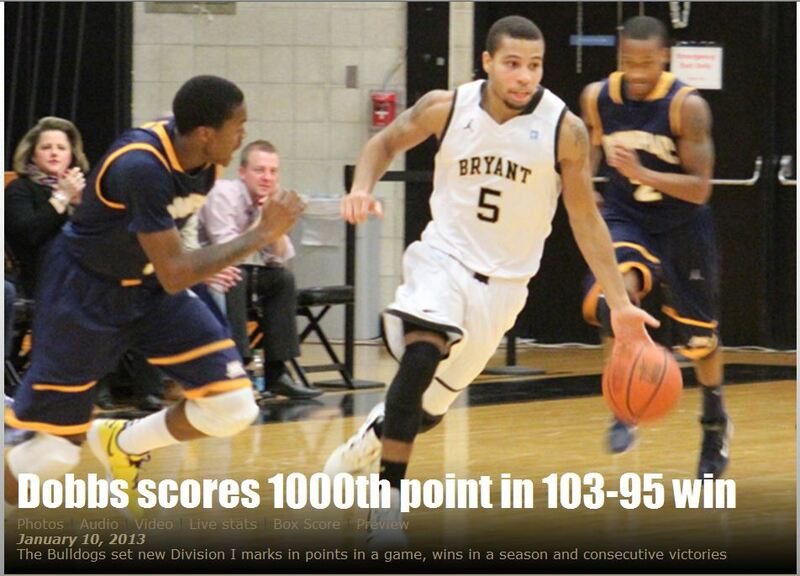 Williams, who had a turnover-free performance, was hot from the start. After Melquan Bolding hit a three to give FDU its only lead of the game at 3-0, Williams nailed back-to-back trifectas and the Colonials were on their way. NEC Front Row will air a total of 15 live hoops games this week, but free live programming isn’t all the league’s digital network has to offer. NEC Now, which debuted this past November, is a short news segment that airs periodically in an attempt to bring fans the latest key stories from around the conference.